Sometimes simple gets the job done! I needed a break from upcycled blues or even something not upcycled but using lots of little pieces. So, I took out some of my leftovers from some clothing items - I suspect scrubs - that we bought in 2015 from the lady from whom we bought her stash. We think it was a manufacturing plant - these are all new fabrics. This is the top I came up with. This one is 57.5"x 68.5". It feels like a very quick, small quilt to me after making all these big, heavily pieced "upcycled blues" quilts - or my 2" series. I used a beautiful purple batik fabric I purchased in Kenya a few years ago when we went there - after I washed it two times first. However, I have my doubts that it is finished bleeding so I opted to leave all white out of this quilt top. And yes, I will be sure to wash the finished quilt with several color catchers. I may even try Retayne with the quilt though I'm not sure it is necessary with these colors. My sis told me she thought it would be better with three zigzags. I told her I couldn't as a lap quilt - not with such a BIG design. And I wanted BIG! So I worked up a simple BIG zigzag with three zigzags. It ended up being a queen size since I know very few people who have full size beds it seems! It would be easy to adjust that though, by varying the border size. This is the layout for a queen size quilt. This queen size is 93.5"x 93.5" as a finished top. This one will definitely be part of my "Easy Block" series. 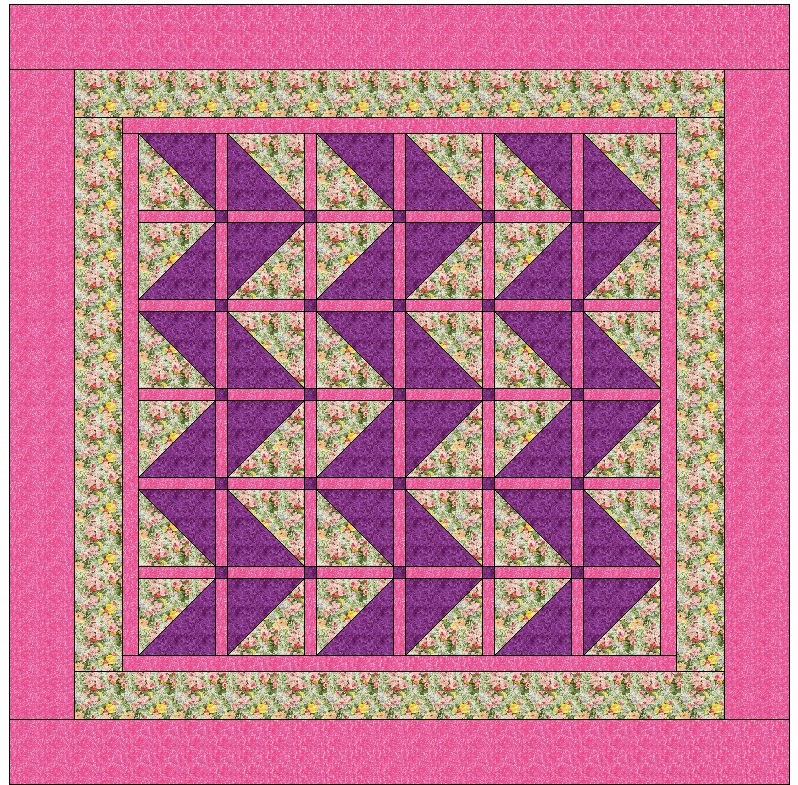 I am trying to do several a year that don't involve a lot of piecing but still have some pizzazz. This would be my first for this year. The pattern is here! I hope someone can use it! I'd like to make this one up again - maybe as a queen size for a quick but effective gift! I included the necessary information in order to make a queen size quilt as well. Let me say, it was wonderful to work with these colors! A nice change for me! Great way to get some fabulous quilt shop quality feel without paying the LQS price! Purple background with white deer heads. Beautiful white daisies and outlines of larger ones on a background of purple. Fabric is called "Let's Play Dolls"
Gradient design: Inside edge starts out a pale gray and darkens into a deep plum. Stars are scattered over the design. "How can you offer these fabrics for so little money?"